There are over 50 Greek restaurants in Berlin. 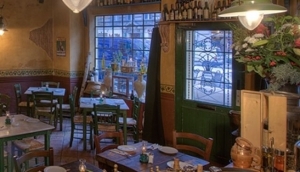 My Destination Berlin’s ‘Greek’ restaurants listing will help you find the best ones. Greek food is known for its use of oils, bread and grains and of course particular vegetables like eggplant (aubergine), and olives as well as various meats like lamb, fish and poultry. Not to mention the Ouzo, their famous aniseed flavoured liqueur. So, if you are tired of the Turkish or Vietnamese restaurants that dominate the Berlin streets, try some Greek, it’ll be good for you!